The town of Foot is the home base of any Airy Peaks campaign. It’s a place for adventurers to rest between delves into the Peaks, pick up rumors, spend their coin, make alliances and enemies with other adventurers, find hirelings, and get caught up in an intrigue or two — especially since it’s the home of the Cult of the White Fangs, the Church of Purity, and a nest of vampires. The characters might even meet a young lady who is really a golem and yet so much more. 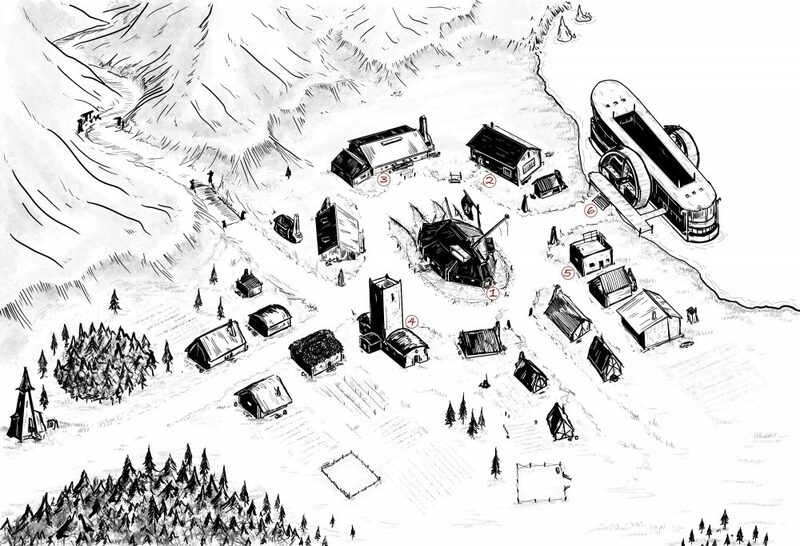 This village is only here because it’s part of Eyetog’s plot to lure adventurers into the Airy Peaks, and it’s where the White Fangs have cultivated the Cult of the White Fangs (See Part 2 of this series). Once the cult and the town have served their purposes, they’ll be wiped off the map by the denizens of the Airy Peaks. Now, none of the townsfolk know that, not even members of the Cult of the White Fangs. What people believe is a wizard put an enchantment on the town so that no monster can set foot within it. There are wild rumors of where the barrier exists, how far it stretches, and days of the year when it stops functioning. It’s all hogwash, but if anyone looks there is a magical aura around the town. No one is really sure what it’s for. 1) The Scales Inn and Tavern. The three story inn and tavern in the middle of town is a local legend. Run by the motherly Jana Kane and worked by her small crew — consisting of a couple of locals who clean and help keep the place up and her cook Jorgen Sur, who supposedly was an adventure who traversed a large part of the Peaks — it’s the best place for a meal, a rumor, or to hire someone to go into the Peaks. 2) The Alchemist Shop. A shop where adventurers can buy and sell alchemical potions and sell or buy reagents. It’s run by Mora Verve, an older yellow-skinned woman. She’s a no-nonsense kind of person and part of the town council. Her assistant is Indras Verve, her very pale-skinned and lovely daughter, who often wears highly concealing clothing that only shows off her hands and head. The reasons Indras wears such clothing, even in the hottest days of summer, is because she’s a construct given life. Mora made a deal with the White Fangs of the Peaks to serve without question and in return the White Fangs gave Mora a method to create the daughter she could never have. 3) The Blacksmith Shop. This sprawling building is run by the dwarf Kurnig Tor, his human wife Barta Tor, their three sons Karn, Torin, and Leif and two daughters Marta and Beryl. The sounds of hammer on anvil can be heard most of the morning and into the evening until dusk. They repair, sell, and buy armor, weapons, farm implements, and anything else that can be forged. Kurnig is also a member of the town council. 4) The Jail. Campbell Sureman is more of a diplomat than a law enforcement person. He and the deputies, known as The Watchmen’s Eyes or The Eye’s for short, often are throwing drunks in the one cell jail — which is all it gets used for. The rest of his job is talking to adventurers and getting them to behave or leave town before he has to let the adventurers police themselves. Which he does. Foot isn’t a lawful place. Foot is about keeping the peace. 5) The Red Water Bathhouse. This little luxury is a wonderful place that adventurers can go and get clean, pamper themselves, and enjoy a bit of relaxation. It’s run by the lovely and pleasant Effie Carson. She’s all about hospitality, but anyone who does anything to cross her or try and cause her harm will find themselves surprised when she melts their face off with a fire spell. 6) The Scarlet Lady. This river boat appeared one night in the Red Lake and that evening the unnatural beauty Ms. Ursula Scarlett and her lovely ladies and gentlemen were there to service the adventurers of Foot. The Scarlet Lady leaves dock at midnight every evening and returns just after dawn every morning. An adventurer can find pleasures of the flesh, games of chance, beverages of all kinds, and any other vice one might be interested in. It should also be mentioned that Ursula and her people are all vampires, or servants of the vampires. They’ve made a deal with the Cult of the White Fangs to be here in exchange for the secrets they learn about the adventurers who delve deeply into the Peaks. That’ll wrap up this installment of the Airy Peaks. In the coming articles I’ll be fleshing out more of the town, talking about some of the adventurers that are in and around the Airy Peaks, dishing about some more of the services, and taking a closer look at some more of the locations and people of the Peaks.